I thought my knowledge of global music instruments was fairly comprehensive. 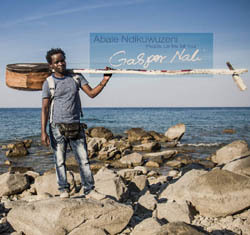 Then I took a look at the thing balanced on the shoulder of Malawi's Gasper Nali in the cover photo of his album Abale Ndikuwuzeni. I'm sure I'm not the only one who, at first glance, wondered why this fellow didn't take up the harmonica. But I'm open-minded and open-eared, so I had to find out what this bizarrely beautiful axe could sound like. Turns out it's called a babatoni and is Nali's own creation. 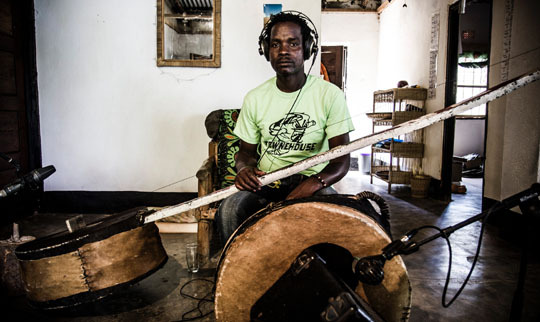 With its cow skin drum resonator, single string and very, very long neck, it may look like a surrealistic representation of a giraffe but sonically comes across rather like a Brazilian berimbau. The babatoni's sole string is struck with a stick held in Nali's right hand while his left moves an empty glass bottle along the string in order to vary the tone. The effect is melodic in a rudimentary sort of way, producing a shimmering, rise-and-fall metallic buzz that you might assume to be electronically created if you hadn't already gotten the visual. Opening with a title track that's just Nali's invention and sprightly voice, the album immediately feels both homespun and celebratory. The rest of the songs add guitar, bass, percussion, keyboards and a jumpy feel similar to African highlife music. No doubt it can be pegged as Afro-pop, but with the babatoni laying down an ambient core throughout, it's uniquely appealing and quite irresistible.